Markazi, the exhibition, casts light on the conditions of mobility and immobility in Yemen and the Horn of Africa, through its focus on households and everyday life in Markazi. Photographs by Nadia Benchallal, taken over several extended visits between December 2016 and October 2017, depict camp residents navigating a state of increasingly permanent suspension. 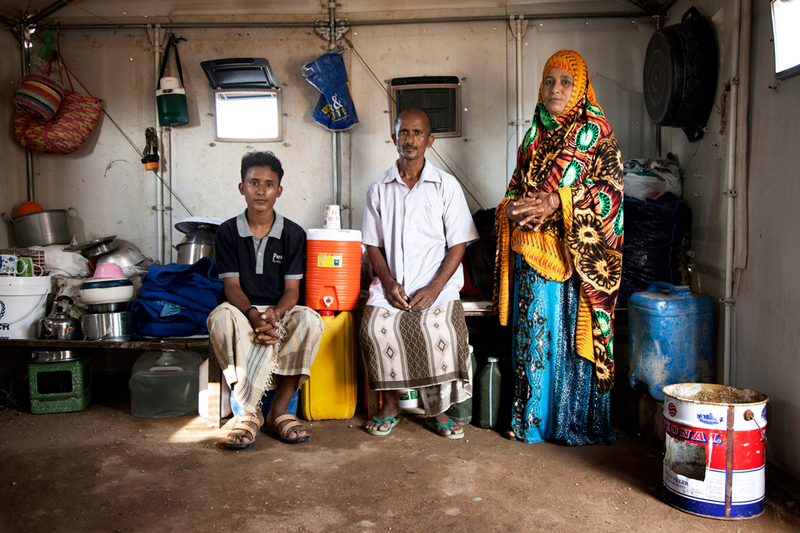 These household portraits attest to the diversity and dignity of Markazi’s – and Yemen’s – population. In addition to Nadia Benchallal’s black-and-white and color photographs, the exhibit features the work of nine Markazi residents who collaborated with Nadia Benchallal and Nathalie Peutz over the course of a year. Nadia Benchallal, an award-winning French-Algerian photographer based in France, studied at the International Center of Photography (ICP) in New York City. Her photographs have appeared in international publications such as, Le Monde, Geo, El País, Time Magazine, Die Zeit, New York Times, La Republica Della Donna, and Newsweek. Her personal photographic explorations provided extensive travel opportunities to Saudi Arabia, Palestine, Bangladesh, Japan, Malaysia, and Turkey, and led to numerous exhibitions in museums, galleries, and photo festivals. Benchallal has received awards from Visa d’Or in Perpignan, Paul Vaillant Couturier in France, the World Press Photo Foundation People in News, and from Face to Face in Spain for her project Sisters, Muslim women around the world. Her work has been supported by a W. Eugene Smith Fellowship, the Mother Jones grant, UNESCO, the FIACRE from the Ministry of Culture in France, and Akkasah Center for Photography at New York University Abu Dhabi. Nathalie Peutz is Assistant Professor of Anthropology at New York University Abu Dhabi, where she teaches in the Arab Crossroads Studies Program. Her research focuses on forced migration, displacement and immobility, conservation and development, and identity and heritage in the Arab world and the Western Indian Ocean region. Her publications include Islands of Heritage: Conservation and Transformation in Yemen (Stanford University Press, 2018); an award-winning co-edited volume, The Deportation Regime: Sovereignty, Space, and the Freedom of Movement (with Nicholas De Genova, Duke University Press, 2010); and several articles on the transformation of Yemen’s Soqotra Archipelago into a World Heritage Site. Peutz has received fellowships and grants from the Council of Middle East Studies at Yale University, the American Institute for Yemeni Studies, Fulbright-Hays (DDRA), the Social Science Research Council (IPFP), the Center for Arabic Study Abroad, and the Andrew F. Mellon Foundation. Her current project, an ethnographic study of Yemeni migrant and refugee communities in Somaliland and Djibouti, has been funded by NYU Abu Dhabi. Opening reception: Sunday, February 4th at 5:30pm.